Amit Ramani is the founder and CEO Awfis, which is a new age technology venture that is redefining the way work gets done in the current business environment, by providing the ecosystem of workspaces for the Small Medium Individual Local Entrepreneurs on a just-in-time basis. 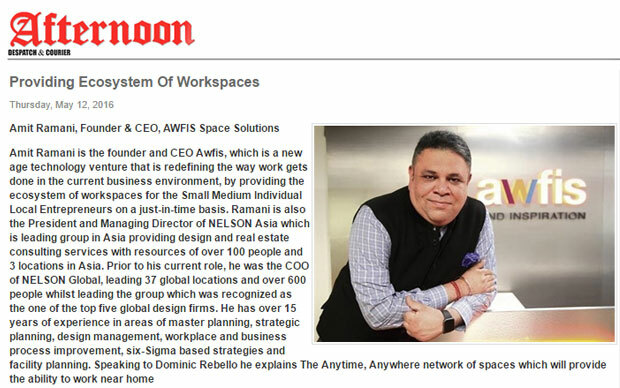 Ramani is also the President and Managing Director of NELSON Asia which is leading group in Asia providing design and real estate consulting services with resources of over 100 people and 3 locations in Asia. Prior to his current role, he was the COO of NELSON Global, leading 37 global locations and over 600 people whilst leading the group which was recognized as the one of the top five global design firms. He has over 15 years of experience in areas of master planning, strategic planning, design management, workplace and business process improvement, six-Sigma based strategies and facility planning. Speaking to Dominic Rebello he explains The Anytime, Anywhere network of spaces which will provide the ability to work near home. The opportunity to disrupt archaic real estate provision and consumption patterns to create a Eco system that allows under-utilised assets to be converted into usable spaces that can be used by consumers in streamlined and transparent way. India is currently witnessing a revolution in the start-up and entrepreneurial culture, triggering a rise in the mobile working population. The Anytime, Anywhere network of spaces will provide the ability to work near home to the young Indian workforce. AWFIS is a new-age venture aimed at providing ready to use, plug and play pro-working spaces/offices, embedded with the best technology solutions for ‘Just in Time’ utilization of fully fitted out commercial real estate/meeting spaces. Focused on redefining the way work gets done in the current business environment, it is primarily for the young, creative, entrepreneurial start-up community of emerging, new age businesses. At operating level our centers have 45 percent occupancy rate and these centers breakeven probably in six month on operating level. Our centers which are 90 days old are 100 percent full. Currently we have earned around 500 plus clients. Of the $10 million initial investment, we have utilised around $3 mn so far and the rest will be used to scale up from current 2,000 seats to 10,000 seats by the end of this year. For the next phase of expansion, we aim to raise $40-50 mn by September this year. Our goal is to be the number one player in India and in the world in the next three to five years. With that goal and ambition clearly we would walk to raise the fund in the market. In the next tranche we are looking to raise $30 to $50 mn from VCs in six to nine months. We aim to cater SME’s, start-ups and freelancers among others from small, medium, individual local entrepreneurs (SMILE) community. We would also like to cater to everyone who would want Just in Time utilisation of work space. We intend to create a niche category through our strategy to be known as pro working spaces. Currently we are operating 2,000 seats and by the end of July 2016, we plan to expand our services to reach around 5,000 seats across Delhi, Mumbai and Bangalore.. We are in process of creating the largest network of managed work spaces and meeting rooms that will enable users to find a space within a 10 minute driving distance across all major metros.